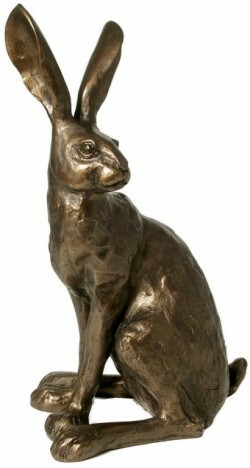 Larger hare sculpture with wonderful detail. Part of this fantastic and mysterious hare collection by animal artist Paul Jenkins. These sculpture ornaments make great gifts, and are fantastic to display as a collection. Made from solid cold cast bronze. Designed and made in the UK. A truly magnificent collection of hare ornaments. 30 cm tall (12 inches).